These are very limited edition series of Dowling Signature instruments, built from the finest woods with exclusive detailing. I have had this guitar in my mind for some time now. I wanted to revisit a guitar that I made for Matheu Watson seven years ago. 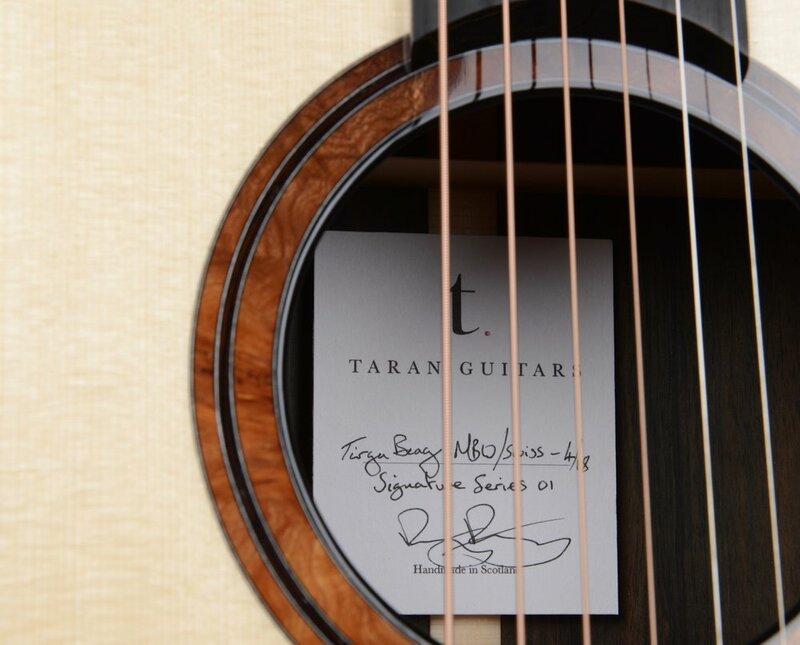 His signature Dana fan fret has a heart of gold, a warmth in the midsection and an incredible focus. 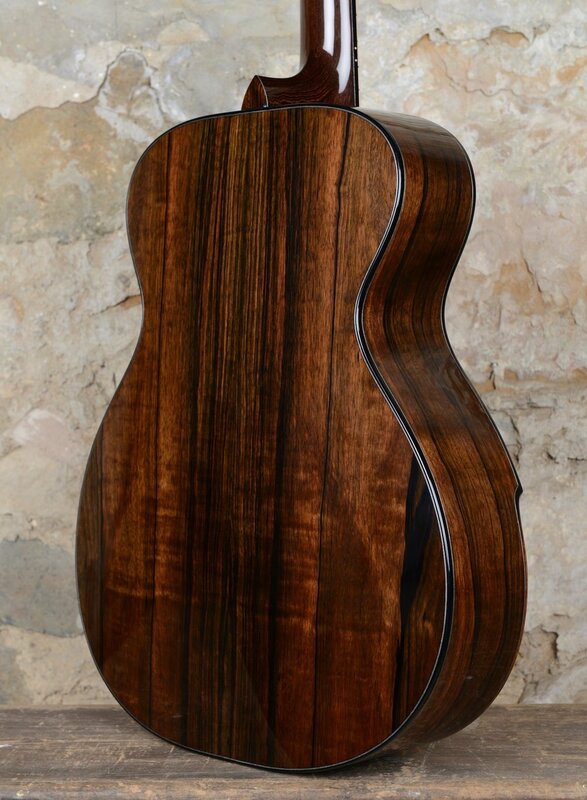 The guitar was made of African Blackwood and Swiss Spruce. However, it was the Wenge neck that really made the difference. When you have an already focused wood like ABW and combine it with a massively dense neck, the outcome is an uncompromisingly direct instrument. The Swiss Spruce pulls out the warmth, making the bell-like notes rounded and simply beautiful. I set out the plans for this very special guitar, with one major change. In 2016, I visited my friend Stefan Sobell to select Malaysian Blackwood sets from Stephen Keys. All of the 30 sets I bought that day were amazing and beautiful. However, there were a number that just had something 'extra'. 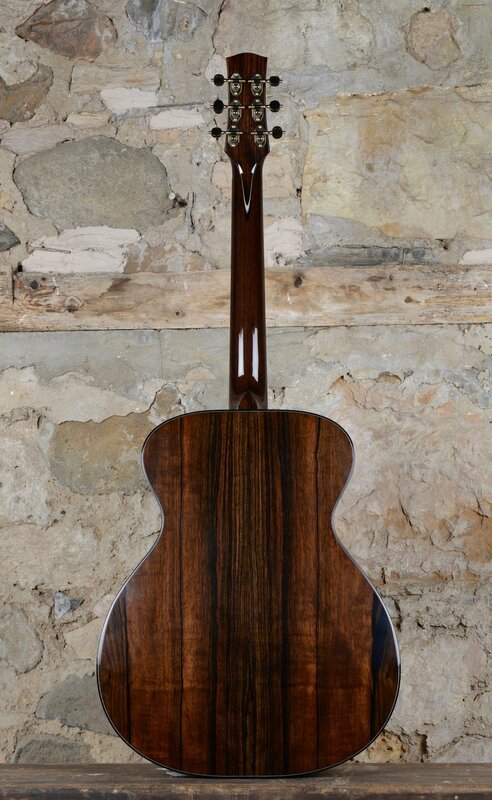 These truly master grade Malaysian Blackwood sets have been put aside for guitars like this one. A new technique which I have learned is 'hot sand fading'. This is the process of carefully heating wood up in hot sand until the colour changes. The hard bit is not setting it on fire which is very easy to do! On the guitar the hot fade was used for the Crail Elm detailing and bevel. Back & Sides - Master Grade Malaysian Blackwood. Soundboard - Master Grade Swiss Spruce. Rosette - Hot Fade Crail Elm and Wenge. Bindings - Ebano & Scottish Sycamore purfling. Front Purfling - Wenge & Scottish Sycamore purfling around the soundboard. Linings - Cured Spalted Beech. Bevel - Hot Fade Crail Elm. Fret Board - Ebony bound with Ebano with 0.3mm white line. Fret Markers - 9Ct Gold dots with 9Ct Gold Circles at 12th fret. Frets - Jessica wire with Semi Hemispherical fret ends. 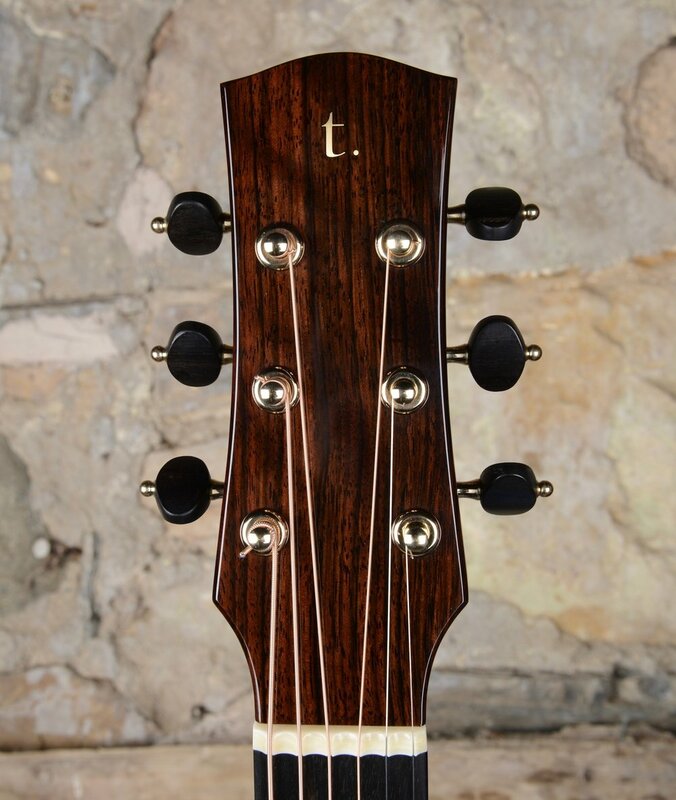 Headstock - Figured Malaysian Blackwood grafts with white veneers under sheaths. Handmade Tuners in Gold & Blued steel by Keith Robson. Hand Carved Solid Ebony Bridge with Ebony Pins. t. Hand cut from solid 9 Ct Gold sheet. My 99th guitar is an exploration into a new area of asymmetrical detailing. However, this rippled Maple and Swiss Spruce Taran has another development at its core. I build with a cylindrical back, not a domed or flat back as is the norm. This cylindrical form helps a number of areas of the guitar. Firstly, it makes it more comfortable to play as the narrowest depth of the body is at the edge of the lower bout which is also where your playing arm sits. Secondly, it makes the back stronger while still able to vibrate. On this Taran, I wanted to work on this second aspect: vibration. With this in mind, I increased the radius of the back, making it naturally stiffer because I wanted this Taran to have power. However, this is where for me it gets very exciting! What if the back could be stiffer and more resonant? I'm used to working with Rosewoods that, when braced, ring like a bell. However, when I brace Maple it doesn't, and this is because there is too much bracing on an already light piece of wood. So, a design change that demanded a new bracing shape. Through a lot of experiments and very careful brace material selection, I have managed to make a back that is stiffer but also infinitely lighter and it rings like a bell. The outcome - A maple guitar that has a richer sound while still being powerful and punchy. Back & Sides - Rippled European Maple. Rosette - Stabilised Russian Birch Burr and black and blue veneer. Front Purfling - Rippled Scottish Sycamore purfling around the soundboard stopping at the Micro bevel. Linings - Laminated Rippled Scottish Sycamore with blue veneer. Bevel - Taran Micro Bevel in Ebano and blue. Neck - Reclaimed light weight Mahogany. Fret Board - Ebony bound with Ebano with 0.3mm white line on player side only. Fret Markers - 9Ct Gold dots with 9Ct Gold Circles at 5,7&9th fret. Blue Russian birch burr at 12th fret. Frets - Jessica wire with Semi-hemispherical fret ends. Headstock - Rippled Scottish Sycamore grafts with black 0.3mm veneers under sheaths.